Tickets 16/14 euro - T. 045 448327 or www.riverbank.ie. Tickets 16/14 euro - T. 071 9650828 or www.the dock.ie. Tickets 15/12 euro - T.0504 90204 or www.thesourceartscentre.ie. Promoted by Music for Wexford. Promoted by Clifden Arts Society. This tour is made possible thanks to funding from the Arts Council www.artscouncil.ie. 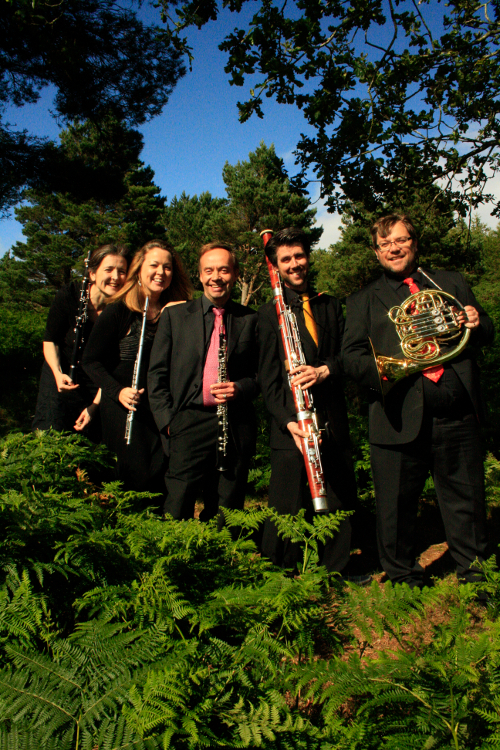 Since being founded in 2010, Cassiopeia Winds have been busy performing throughout Ireland. Highlights include performing the Poulenc Sextet with renowned Irish pianist Finghin Collins in 2011, and concerts at the Music for Wexford Concert Series in 2012 and at Waterford Music in 2013. In 2014 they were invited to perform at the Music for Galway Midwinter Festival, and at the New Ross Piano Festival. Also in 2014, they performed live on Lyric FM's Classic Drive for the opening of the new Tower Records in Dublin, and were invited by Lyric FM to perform at the Bloom Festival. In 2015 they commissioned a new wind quintet from Irish composer John Buckley, his Wind Quintet No.2, with funding from the Arts Council of Ireland. The work was then performed throughout Ireland, as Cassiopeia Winds undertook a national tour in the winter of 2015/2016. Cassiopeia Winds in concert with Finghin Collins, in a concert for GOAL, May 2011. � Copyright Cassiopeia Winds 2011. Photography by Emily Manning.